Male Widespread and locally common throughout the UK in open, not too dry, habitats; grassland, although less so on calcareous grassland, parkland and cultivated fields where it may be the dominant species (Luff). Found occasionally around Watford, mostly from the Whippendell wood area during the summer months. Despite some considerable effort pitfalling in apparently suitable habitats e.g. Oxhey park, Radlett road fields we have failed to find the species and neither have we recorded it from the many thousands of nocturnal carabids examined from parkland pathways during 2006/2007. 12-18mm. Entirely black but for extremities of palpi and antennae. Antennae shorter than in other similarly sized carabids, pubescent from 4th segment, basal segments not keeled above (cf. 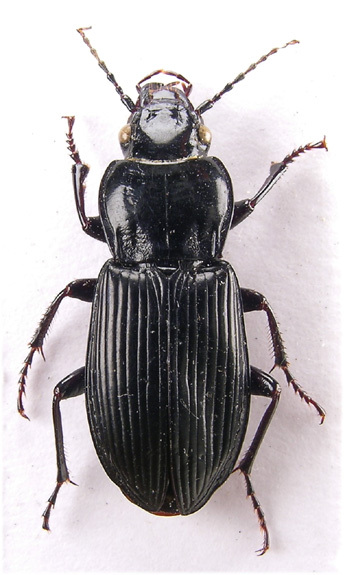 Poecilus cupreus). Mandibles sharp, symmetrical. Frons with two setiferous punctures beside eyes. Pronotum smoothly rounded in front of denticulate hind angles, with double basal fovea but these often appear as a single wide depression delimited from side margins by a ridge. With wide lateral margins and strong borders. Elytra glabrous with 8 distinct striae across middle, with two punctures in 3rd interstice or adjoining 2nd stria, the posterior well removed from apex, 9th interval much wider than 10th. Completely covering abdomen, sinuate subapically and with crossed epipleura. Last tarsal segment finely setose beneath, this is the easiest character to distinguish the present species from P.niger and P. nigrita. Claws smooth. Male with basal pro-tarsal segments dilated.